You are here: Home » Community, Local authorities » Observer asks: What’s to be done with East Sussex County Council? Our Saturday independent columnist, Observer, says DIY can only go so far to replace cut local government services. 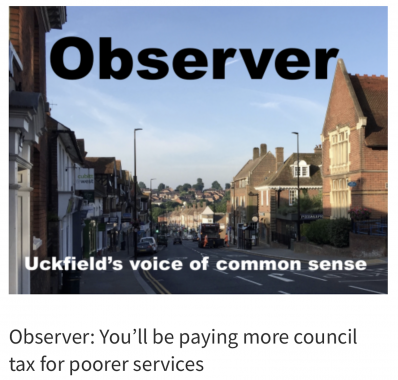 Early this year I predicted you would be paying more council tax but get less for your money. That doesn’t make me Nostradamus, of course. It’s the sad reality of the cuts that local government has endured over the last decade. Less and less money is coming down from central government to local government – the difference being picked up by rises in council tax and cuts to services. Costs of course are rising, especially in providing social care. the state of the roads, which in many places are no more than a rough, patchwork, ‘moth-eaten’ quilt of asphalt. Next in line will be the charges to be introduced at household waste recycling centres for such items as rubble, plasterboard, tyres etc. In other parts of the county, public libraries will be closed or have been closed. In the short term, volunteers and residents can step in; as they already are in some places where public libraries have closed. On housing estates, people can cut the verges themselves near to their properties. We all know that we personally have to take more responsibility for keeping the streets clean of litter – thank you to the Brighter Uckfield volunteers. That’s probably the extent of the DIY. Road mending is just not feasible. What’s to be done with East Sussex County Council? East Sussex should be asking this question itself. Can services be delivered more effectively at lower cost on a local basis? The difficulty would be that the county council would still want to hang on its council tax monies – something I cannot see them wanting to give up willingly. The bottom line is that local government needs to be reformed to make it fit for purpose in the 2020s and ensure it doesn’t take up ever increasing amounts of people’s income.